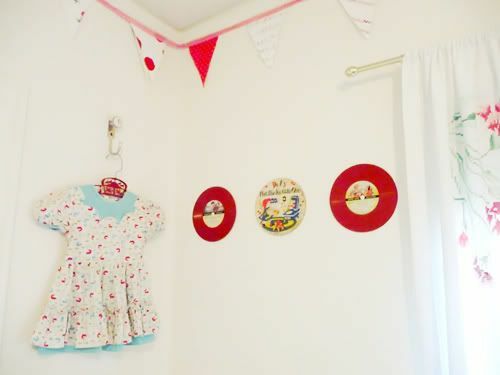 Kiddo Rooms :: Georgia’s Darling Retro Nursery. 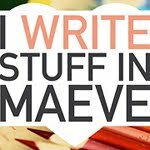 Oh me oh my! Oh my oh me. 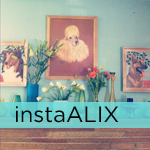 So last week I showed you a darling nursery that incorporated GREY WALLS. (Yep, it sounds unusual but trust me, everyone flipped for it, it was THAT GOOD!) 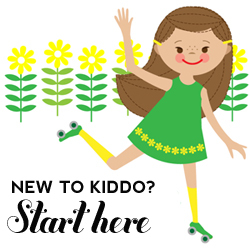 This week I thought it would be fun to take a peek at another nursery. The twist? 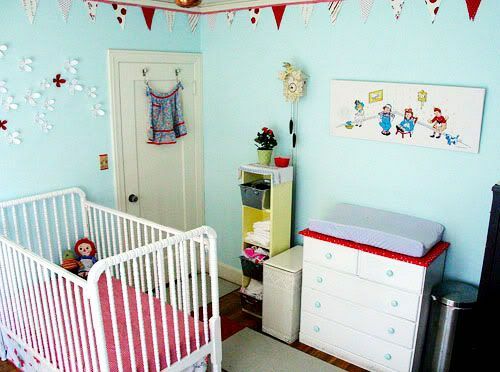 Those pretty robin’s egg blue walls belong to a little girl! 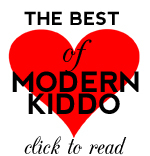 This sweet room is a special one because it belongs to my clever partner in crime here at Modern Kiddo—Miss Dottie! Well technically it belongs to her darling little girl Georgia (she, of the legendary 99 cent jumpers!). I really love the color palette: pale blue with bold red accents. Soothingly calm-yet-feisty and fun. 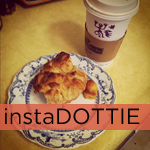 Hmmm, kinda like Dottie! I think you guys are going to love the fun vintage touches in here. Remember what I said about hanging old vinyl on the wall? Check out those red vinyl 45s! Add in a little dressie and you have some fabulous wall decor! I love the sweet 40s/ 50s influence in here—from the little clothing on the wall to the playful flag banner running around the perimeter of the room. Also love the quirky modern touches like those fun plasticky flowers on the wall. So great! Ach du lieber! 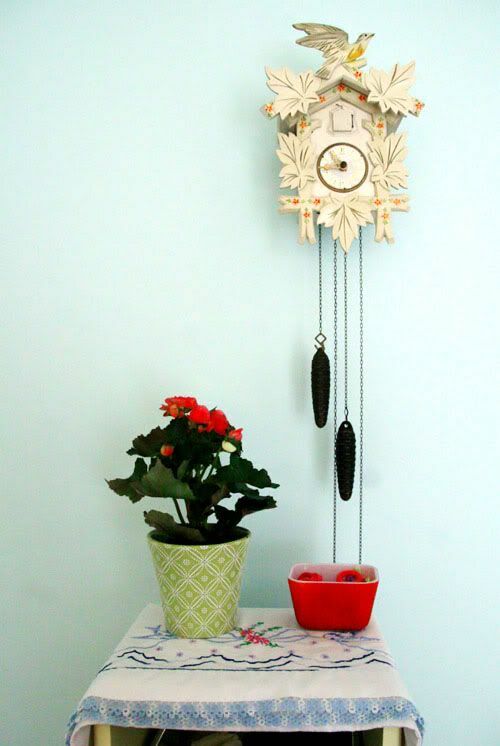 Zis cuckoo clock ist wunderbar!!! Again, LOVE those vintage records on the wall. 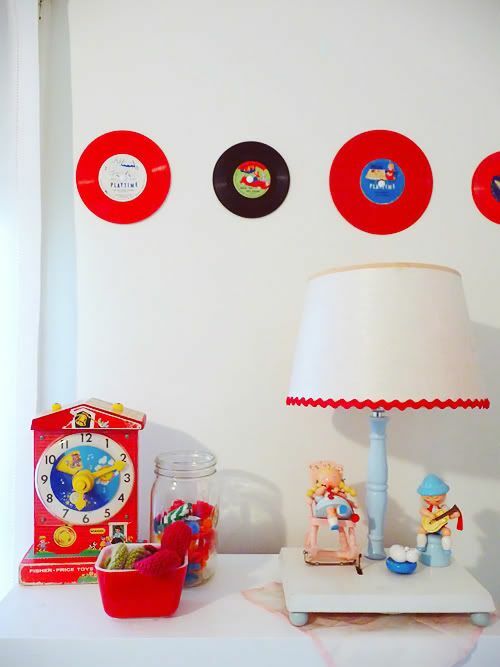 You’ll also notice some old skool Fisher Price and a fabulous Irmi storybook lamp (which we profiled a while back!). I am obsessed with vintage suitcases so you can imagine my squeal of delight when I saw that saucy stack of red lovelies! How great are they? They are resting on top of Georgia’s “closet”. 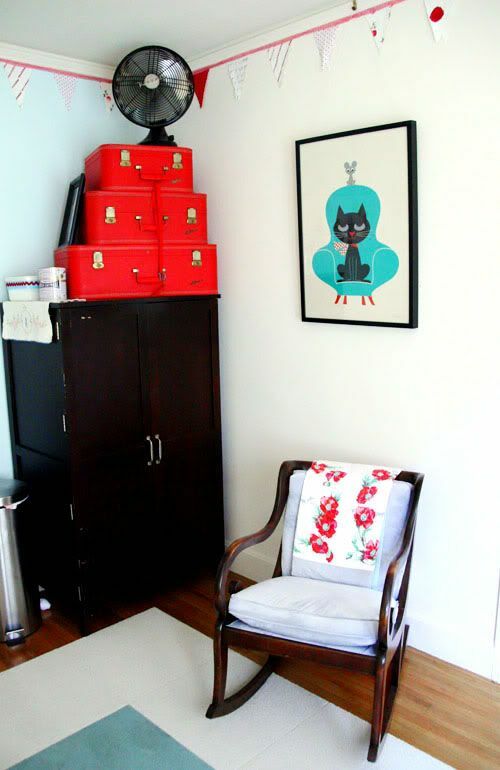 Dottie took her old office cabinet and transformed it into a a wee armoire. Super clever, lady! 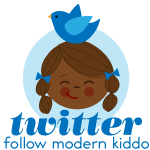 And of course it wouldn’t be Modern Kiddo if we didn’t take a Vintage Kiddo peek into that awesome closet. Um, the gingham hat bloodhound?? What what WHAT?? Dying. 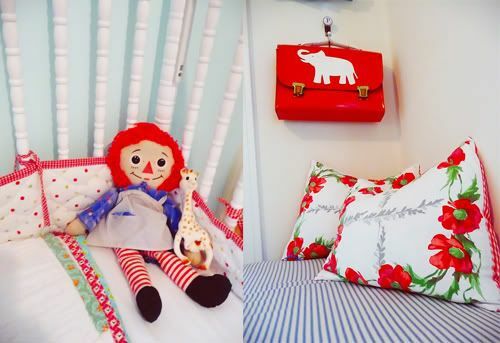 Thanks little Georgia for sharing with us your stylish and adorable space! 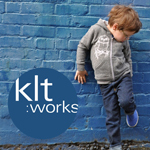 Posted in Best of Dottie, Kiddo Rooms. 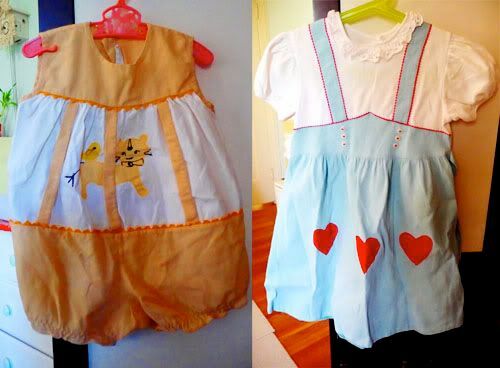 Tagged with 40s, 50s, kid's room, retro, retro nursery, vintage nursery. this is by far one of my fav nurseries EVER. i AM DYING! DYING!!!! i love this so much!!!! oh my gosh!!!! and the outfits! glorious!! swooners!! oh! and that clock… it amazing! Love what you’ve done with that room. It looks like you’ve made the most of the space you had. You have quite an imagination. What did it look like before you redecorated? I am so jealous of Peach. I want to trade rooms with her! I was just saying to my hubby last night while watching project runway finale how much that I love the the robin egg blue and red combo. Divine! amazing!!! 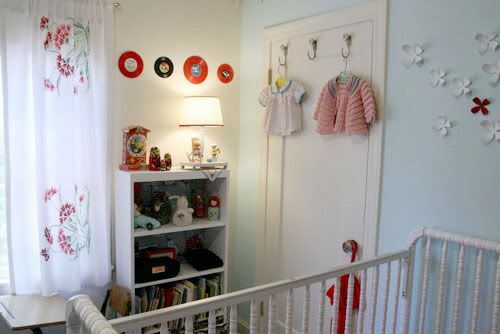 i especially love the crib skirt!!! and don’t even get me started on those clothes!!!!! DARLING! I love the color palette. 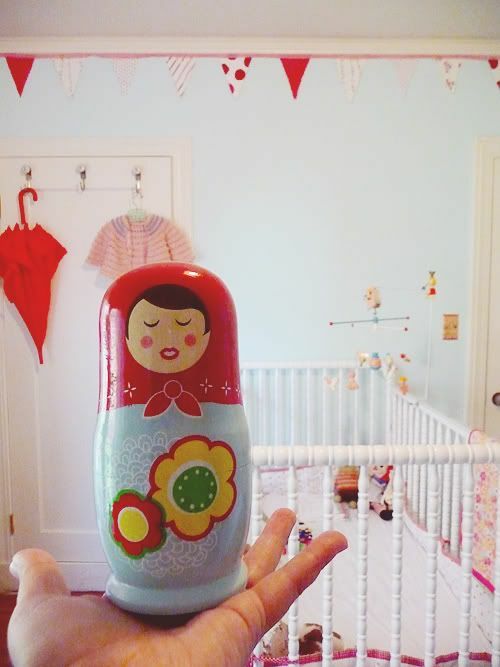 My daughter’s room is also blue (though more on the periwinkle side than the aqua side) and I find it a wonderful antidote to the plethora of pink things that she has accumulated. A dose of blue or green makes the pink sweet instead of saccharine I guess! Oh my, thank you for all the compliments. !I must say I started this more than a year ago and I just hung the last picture. 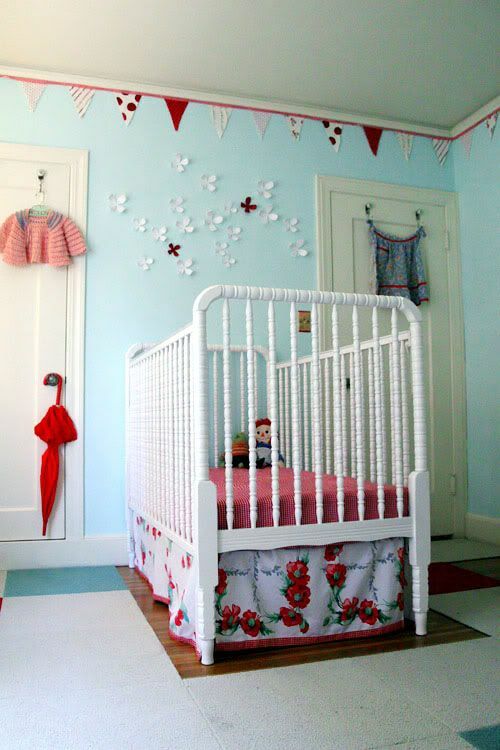 Lishyloo–the jenny lind crib is from BabieRUs–we used a gift certificate. 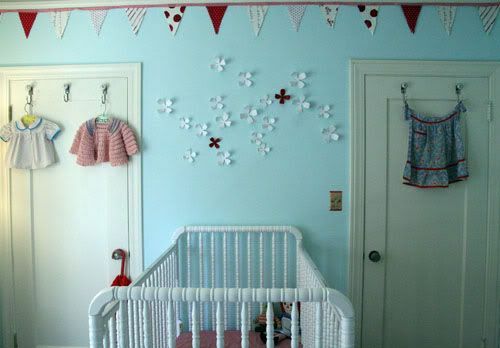 And I originally was going to do gray walls based on the gray in the crib skirt which I made from a vintage table cloth I liked, but at the last minute decided on blue. 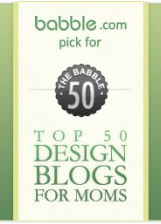 Once again, thanks for the nursery love! In our old house we painted our daughter’s room the same blue–I love that color!! And hanging dresses is the best way to enjoy them before they fit 🙂 This is giving me great inspiration for a put together room in the next house! So cute! 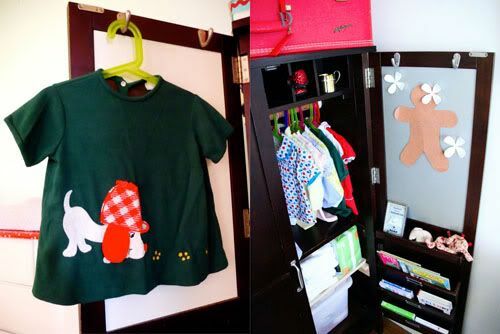 Love the flower art on the wall and that sweet artwork over the changing table! The color combination is my fave! !